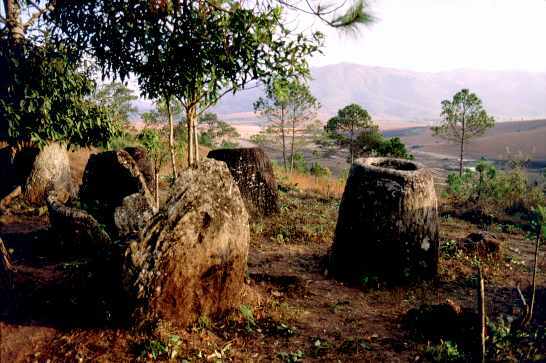 Travel Tales - Laos; The Plain of Jars. Back to Travel Tales Page or Laos - Vientiane, Vang Vieng, Luang Prabang. Wed 3 Jan. Luang Prabang to Phonsavan, Laos. Get early to LP airport, meet Micki, Sam and Gadi also catching my flight - glad to have the company. Flying on notorious Lao Aviation is not lightly to be undertaken, and certainly not alone. Pass under the infinitely unreassuring sign saying 'All passengers have insurance' and through a diligent passport-and-visa check. One of the engines coughs and misses a stroke or two as we taxi to the runway, and both engines judder and grind. The whole plane shakes with turbulence, steam pours from the airconditioning vents, a suspicious crackling sound comes from the front of the plane, and the cabin fills with a smell of burning rubber. This is not unusual. The ranks of marching jagged green peaks round Luang Prabang fade down to a softer, more rolling landscape as we climb onto the upland Plain of Jars. Coming in low, the olive, straw and khaki coloured squares of fields are peppered with small round ponds - countless bomb craters. Laos is the most heavily bombed country in history: The USA had no legal mandate to fight there, indeed was specifically banned from fighting by international treaty, yet between 1965 and 1973 still managed to drop more explosive - much of which lies around today, still claiming an average of 20 people a month - than on any other country in the history of war. Fortunately for the US, there was a big ol' shindig going on over the border in Vietnam at the time, which got all the attention, and the war (known to the Laos as 'The American War') is pretty much forgotten outside Indochina. An extensive article on Phonsavan and the war is available here. With a thud and a crunch, and a feeling of relief the plane has landed. We get picked up from the airport by Khong Keo, fishing for Farang, taken to his guesthouse in an ancient russian jeep and then whisked off on a tour of the plain of jars. The largest group (out of thirty-odd sites) is a little touristy, with a pavillion and neat paths, winding between the giant (up to three-plus metres) jars hollowed out of solid lichen stained stone. Less visited site two is much more romantic, perched on a ridge overgrown with pine trees and brambles, overlooking a broad valley rimmed by black hills, opium poppies dancing in the distance. Thur 4 Jan. Phonsavan, Laos. After Micki, Sam and Gadi leave, I get kind of adopted by the family (I think they feel a bit sorry for me being on my own), eat my meals with them, and get taken along to a couple of weddings. Fri 5 Jan. Phonsavan, Laos. After Phonsavan I head back to Vientiane, then over the border to Nong Khai (where I have to extricate myself from a night out with a Lao rich kid who, it becomes clear half way through the night, is intent on sampling as many as possible of the forbidden delights of Thailand by taking us to the local brothel), and then back to Bangkok for the final flight. It's been eleven months, thirteen countries on three continents and a greater success than I ever hoped for. But sitting on the verandah of the guesthouse with a Lao coffee, looking out over the soul-deep tranquillity of Laos as the sun chases high-altitude night cold from my hands and feet, this is really the end of my trip. From now on, I'm on my way home. Back to Travel Tales Page.